Camshaft alignment tool – No.T10414. Camshaft sprocket holding tool – No.T10172. Crankshaft pulley holding tool 1 – No.3415. Crankshaft pulley holding tool 2 – No.3415/2. Crankshaft timing pin – No.T10340. Install crankshaft timing pin  . Turn crankshaft slowly clockwise until it stops against timing pin. Remove hose connecting block from rear of cylinder head cover  . Ensure groove in rear of camshaft positioned as shown  . Remove camshaft sprocket bolt  . Hold camshaft sprocket with holding tool. Fit timing chain to crankshaft sprocket. Fit timing chain to camshaft sprocket. 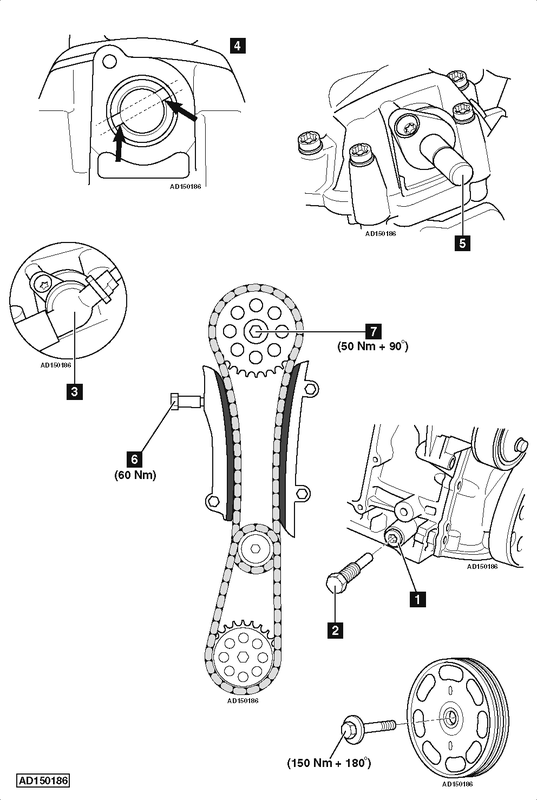 Install camshaft sprocket and chain as an assembly to camshaft. Finger tighten bolt  . Install the used crankshaft pulley bolt and tighten to 50 Nm. Ensure camshaft alignment tool can be fitted  . If not, repeat installation procedures. Tighten camshaft sprocket bolt a further 90°  .